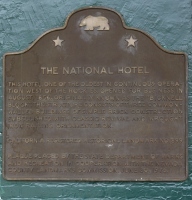 The National Exchange Hotel opened for business on August 20, 1856, the exterior is virtually unchanged since its construction as three brick buildings in 1856. 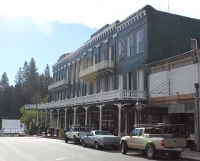 The National is one of the oldest continuously operating hotels west of the Rockies. The hotel is still in operation. A closer view of the architectural details on the second and third floors. 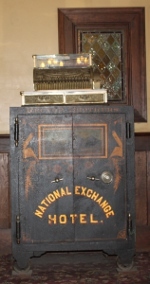 Antique safe in the lobby.